Former GM marketing chief, Joel Ewanick, is stepping in to replace retiring John Beattie, in a move that could reawaken rumors that Fisker plans to take on the Chevy Volt in a few years. Fisker Automotive is continuing a trend of hiring former top executives from GM. This time reports are circulating that Joel Ewanick, the former head of marketing at General Motors, is being hired as interim chief of global sales and marketing following the retirement of Richard Beattie. The company reportedly informed dealers on Monday of Beattie's retirement. Beatti's tenure, which began last December, has been marked by a string of difficulties beginning with a revelation last December that A123 Systems had mis-manufactured battery packs. That disclosure led to a recall, and several other problems from A123 Systems caused that company to spend excess capital fixing problems, ultimately leading to A123's bankruptcy. Fisker Automotive also served as a political football to kick around, with Romney, in July, reciting a bunch of false information about the company, and in October calling Fisker a 'Loser' (along with Tesla Motors) during the Presidential debates. The Fisker Karma also won several prestigious design awards during his tenure, and opened a number of dealerships in Canada, Europe, the U.S. and even the Middle East. Ewanick is a seasoned auto industry executive who has held top marketing positions at G.M. and Hyundai, and previously at Porsche. His tenure at GM was spotty, however, and he eventually was ousted amid allegations of not disclosing the cost of a sponsorship deal with Manchester United. He has been working with Fisker for a few weeks on a consulting basis, and will join Fisker on an interim basis until a permanent marketing chief is hired. Ewanick will report directly to Fisker's new CEO, Tony Posawatz. 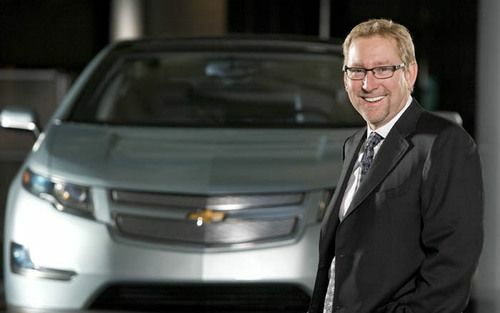 Posawatz had previously led GM's Chevy Volt program. The two clearly know a lot about GM's plans for electrified vehicles of all stripes. This is interesting in light of recent rumors that Fisker is planning to produce an inexpensive plug-in hybrid car that's meant to take on the Chevy Volt. If true such a car will come several years in the future, and possibly be manufactured in partnership with a larger automaker.